Almost all trout fishing guides work equally as well with beginners, men, women, and children. If you have never trout fished let your guide know. They'll do all the work for you, baiting hooks, rigging lines and lures, casting, netting your trout, and removing trout from your hook. If you wish to keep trout for the dinner table your guide will also clean and fillet your catch. All you need to do is have a good time! If you're ready to pursue a trophy trout your best best is fishing with a top pro guide. 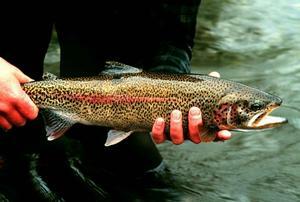 Any trout weighing four or more pounds is considered a trophy, but trout weighing much more are caught every year. Fishing for trophies is very different from fishing for trout in the 12 to 18-inch size. Tell your guide you want to fish for trophy trout and he'll explain the process. Both the White River and the North Fork River have varying regulations which change from time to time. If you fish with a trout fishing guide your guide will know all the laws and regulations. If you are fishing without a guide, pick up a copy of the Arkansas Trout Fishing Guidebook. These are available anywhere you buy a fishing license. You can also read fishing regulations, plus buy licenses, at the Arkansas Game & Fish Commission Web site.